Photo by Ron Johnston Parkersburg High’s Ben Lake participates in the 19th Annual Chick-fil-A Invitational Saturday. Lake finished fourth. MINERAL WELLS, W.Va. — If Franklin Angelos seemed hurried after running Saturday’s 19th Annual Chick-fil-A Cross Country Invitational at the Wood County 4-H Grounds, there’s a reason why. That’s right, Angelos is competing in two varsity sports at Parkersburg High this fall — cross country and soccer. Angelos, who excelled on the middle school race course at Wood County Christian School in Williamstown, was competing in only his second varsity XC run. Aaron Withrow of Winfield finished first in 15:51.4, and Jacob Birurakis of George Washington was second in 15:58.6. Carter Lipscomb of Doddridge County was third in 16:17.9. The Big Reds as a team were runners-up with 94 points to Winfield’s 84. Ritchie County and Doddridge County were third (132) and fifth (200), respectively. Parkersburg’s other runners were Keegan Barnette, Anthony Bradford, Austin Handley, Logan Bock, and Ethan Rutherford. “The rest of the guys ran real well today,” Lake said. Parkersburg South, 13th overall, was paced by Seven Parr, who was clocked at 18:11.3. Marietta High was 20th in a field of 27 schools with 503 points. Wyatt Mircle was the Tigers’ top runner with a time of 18:36.1. On the girls’ side, Tori Starcher of Ripley claimed her second individual Chick-fil-A title with a first-place finish of 17:43.1. The talented junior also won the race when she was a freshman two years ago. Starcher was pushed by Parkersburg High junior Madison Trippett, who was second in a PR (personal record) of 17:59.2. “She is such an awesome competitor,” said Starcher of Trippett. “Coming up the last hill, we were both side-by-side. Trippett said that in the last three-quarters of a mile, Starcher “pulled away” from her. “I just couldn’t go with her,” said Trippett, who was first in a race at Cabell Midland last weekend. As a team, the PHS girls were fourth with 158 points. The Big Reds’ roster included Olivia Collett, Mya Barrett, Erin Schumacher, Madi Mace, Abby Broadwater, and Claire Flanagan. Ella Hesson of Williamstown was third in 19:05.5. The sophomore standout was instrumental in helping the Yellowjacket girls finish runners-up with 107 points to Winfield’s 94. The Williamstown team also featured Natalie Sawin, Chloe Lightfritz, Emilee Ellison, Stella Flanagin, Maybree Rinard and Torie Combs. Parkersburg South’s Abby Herring was seventh overall in 19:43.1. The Patriots were eighth with 243 points. Marietta finished 17th in a field of 25. 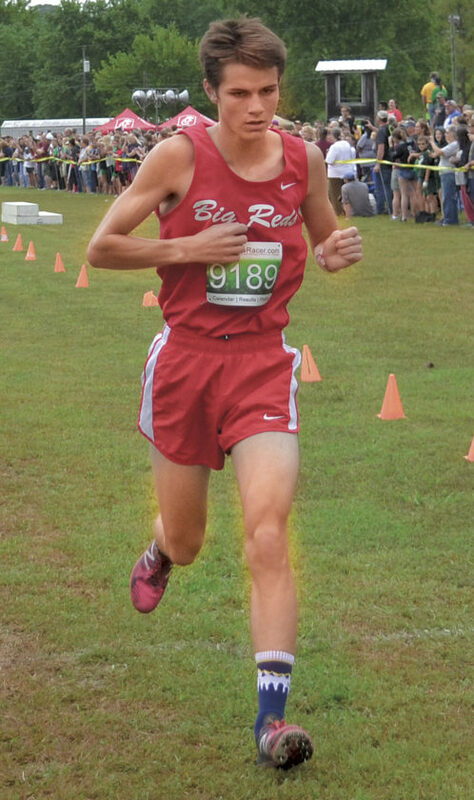 Sage Austin led the varsity Tigers with a time of 22:59. MHS sophomore Ciara Space won the JV race in 21:06.8.